Top row: Adams portrayed by Sam Goodyear, Franklin portrayed by John Hamnant; Bottom row: Jefferson portayed by Bill Barker, Dickinson portayed by Rodney TeSlaa. Photos courtesy of the Colonial Williamsburg Foundation and Rodney TeSlaa. A “live” interview and Q&A session with the nation’s Founding Fathers on Thursday and Friday, Dec. 4-5, at Hope College will present an opportunity for audience members not only to learn about the origins of the United States but also to experience production of a television pilot. The event, which will take place in the main theatre of the college’s DeWitt Center at 7:30 p.m. both evenings, will become the one-hour pilot episode of a proposed PBS prime-time public television series called “Inventing America.” The scripted performance will be followed by an audience question-and-answer session in which the Founders will apply their ideas to the 21st century. The public is invited. Admission is free, although advance ticketed reservations are recommended. Created by Holland resident Milton Nieuwsma, a two-time Emmy Award winner, the program will tell the story of the American republic and apply the Founders’ ideas to the present time. The format is modeled after Steve Allen’s classic “Meeting of Minds” series, which aired on PBS from 1977 to 1981. The first episode will tell the story behind the Declaration of Independence. The evening will feature three of the Declaration’s signers—Thomas Jefferson, John Adams and Benjamin Franklin—and one delegate to the Second Continental Congress, John Dickinson, who refused to sign, revealing the conflict behind the historic event. While imagined and presented as a retrospective, the conversation will be based on fact, using the Founders’ actual words. 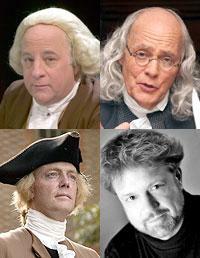 Jefferson, Adams and Franklin will be portrayed by Bill Barker, Sam Goodyear and John Hamant respectively, all of whom are actors with Colonial Williamsburg, and Dickinson will be portrayed by actor Rodney TeSlaa of the Greater Grand Rapids area. The moderator will be Marc Baer, professor of history and chair of Hope’s department of history. The director is John K.V. Tammi, professor emeritus of theatre and the founding artistic director of the Hope Summer Repertory Theatre. The pilot will be filmed by WGVU-TV, the PBS affiliate in Grand Rapids. If PBS approves the project, the series will be co-produced by WGBH and Hope College and broadcast on 350 PBS stations in the United States and its possessions. The number of episodes will range from three to eight, depending on funding and viewer response. Tickets may be obtained in advance at the ticket office in the college’s Events and Conferences Office, with any remaining tickets available at the door. Located downtown in the Anderson-Werkman Financial Center at 100 E. Eighth St., the office is open weekdays from 10 a.m. to 5 p.m. and can be called at (616) 395-7890. The DeWitt Center is located at 141 E. 12th St., on 12th Street at Columbia Avenue. Nearby parking includes college lots accessed from Columbia Avenue north of 13th Street; from 10th Street between Columbia and the railroad tracks; and from 13th Street between Columbia and the railroad tracks. The Hope College admissions office will sponsor a visit day for prospective college students on Friday, November 21.